Y ou probably have notions about what it’s like to live the glamorous life of an author. The champagne, the accolades, the fancy hotel suites. But wait, there’s more! Let me tell you about the Hysterical Fiction Tour. An epic journey that could’ve been disastrous on our friendship if my fellow authors weren’t so much fun, cheerful, and down-to-earth, taking all setbacks in stride. 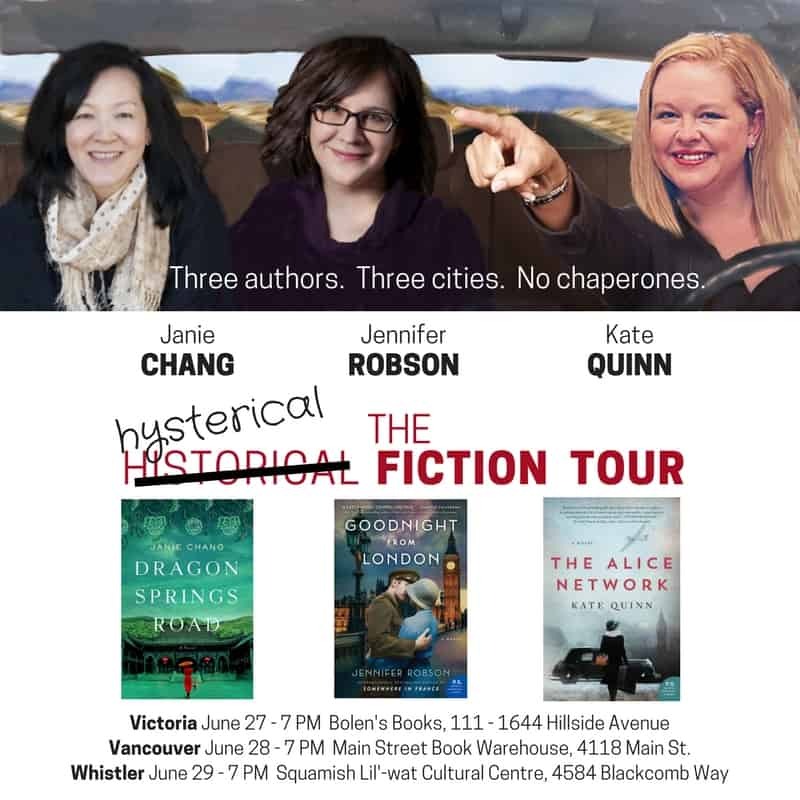 This started months ago when my publicist asked whether I’d like to go on a mini-tour with authors Jennifer Robson and Kate Quinn. Jen’s latest novel, Goodnight from London, has been on bestseller lists since it came out and so has Kate’s latest, The Alice Network. Both would be in Portland at the Historical Novel Society Conference, so while they were in the Pacific Northwest, why not add on some events on the West Coast of Canada? Victoria, Vancouver, and Whistler. “Absolutely,” I said. “Jennifer and I already know each other. I’d love to meet Kate. And I can do the driving. This is my home town after all.” Words that would come back to haunt me. Our favourite photo from the tour. The Wonder Woman pose. More or less. Jen, Kate, and I got on email to figure out how to promote this road trip. Our publisher would not be sending a publicist along to mind us. It would be three authors, three cities, no chaperones. We wanted to bill this as The Hysterical Fiction Tour and we even created a poster we wanted to use. But our publicists nixed it. Too comedic. Set the wrong sort of expectations. Too much focus on the authors and it should be about the books. So we went with something a little more traditional. Our publicists are the PR professionals so we abide by their rules. Little did we all know it really would be hysterical. 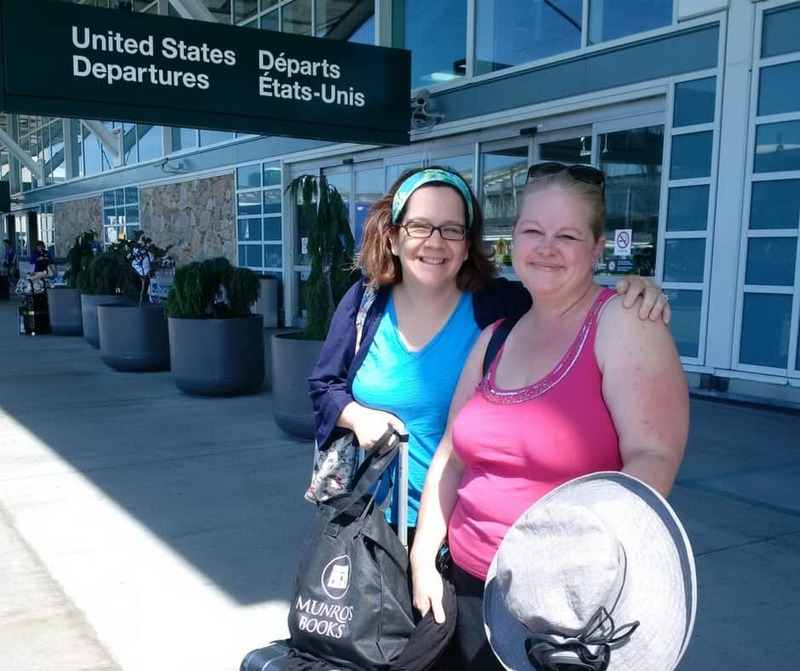 First clue that every day would involve a Jinx of the Day came when Jen and Kate’s connecting flights didn’t connect and they spent six hours at Seattle-Tacoma airport. Being hardworking authors, they used that time very productively to resolve plot issues for Jen’s next novel. Meanwhile in Vancouver, I got ready for the drive to Victoria, which involves getting on a ferry. Within 5 minutes of leaving the driveway I realized the car’s air conditioning wasn’t working. Which was pretty maddening since our mechanic had had the car for 5 days while we were in Oregon, for the sole purpose of repairing the AC. Once parked at the ferry terminal, I phoned Peter. The earliest I could get the car back to him would be Thursday morning, after we were back from Victoria and before we had to go to Whistler. That was the best option available. He promised to make the AC a priority. And with that, I drove onto the ferry. Then met up with Jen and Kate at our hotel in Victoria where I gave them the news. Kate and Jen said not to worry about the AC, they remembered road trips from the days when not every car had AC. 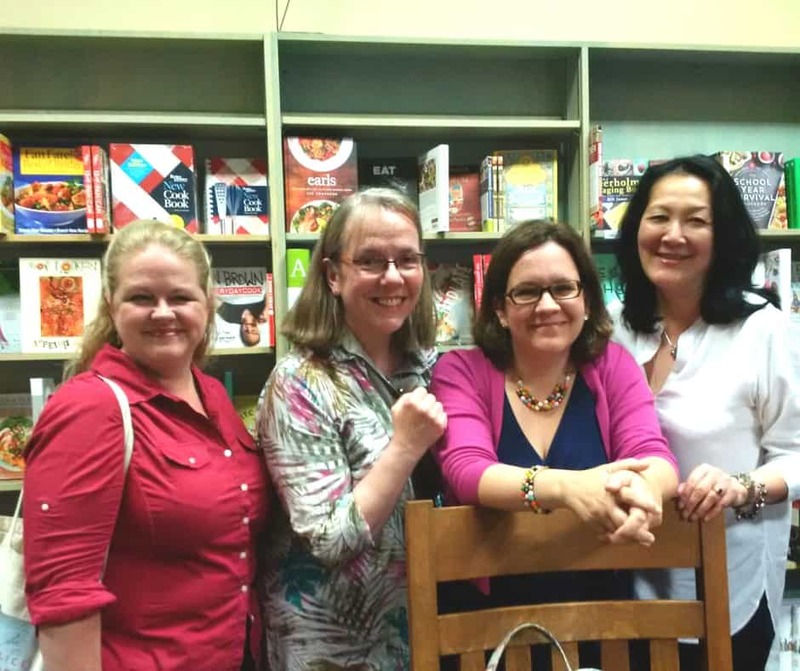 We had a lovely event at Bolen Books. Lots of people turned up, writer/editor Moira Dann was a wonderful moderator, and we signed lots of books. That's Moira, below. The following morning, we drove onto the ferry to travel from Victoria to Vancouver. It was a Tourism BC propaganda day. 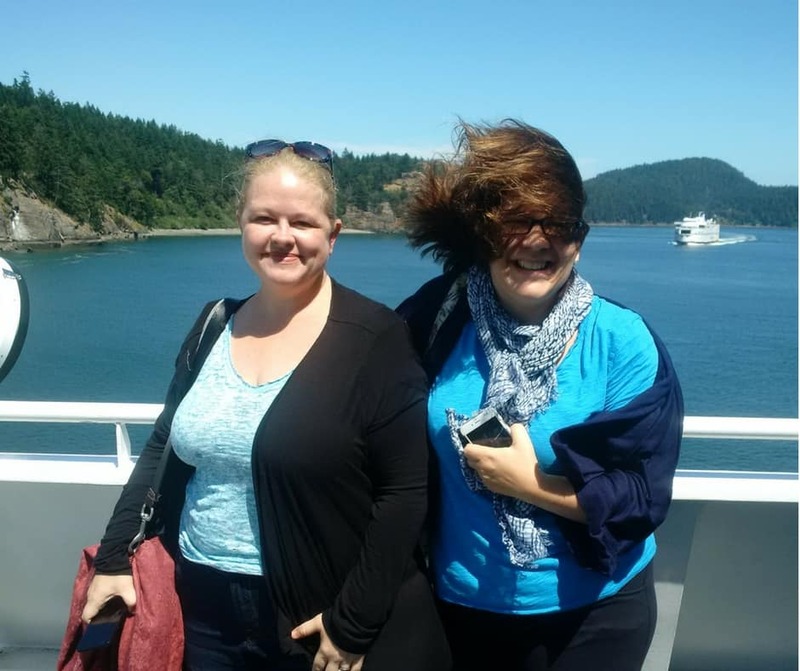 Beautiful views of the Gulf Islands, a smooth crossing, much ooh-ing and aah-ing from Jen and Kate. This is my favourite photo of these two eminent authors from that ferry ride. Kate twisted up her glorious hair in a nice tight bun. Jen went for the windswept look. Our car was one of the first to get off the ferry - which meant we weren’t stuck behind the 500 other cars all charging onto the same highway to get to the city. Except that a utility truck had flipped on the highway and was holding up traffic. Along with a thousand other cars, we sat parked for an hour, eventually turning engines off. And have I mentioned the no AC thing? Thanks to cellphones we were able to call Indigo Books, where we were supposed to sign some stock (not a customer event, just to sign books). We let them know that Jen and Kate would have to go over the next morning instead. 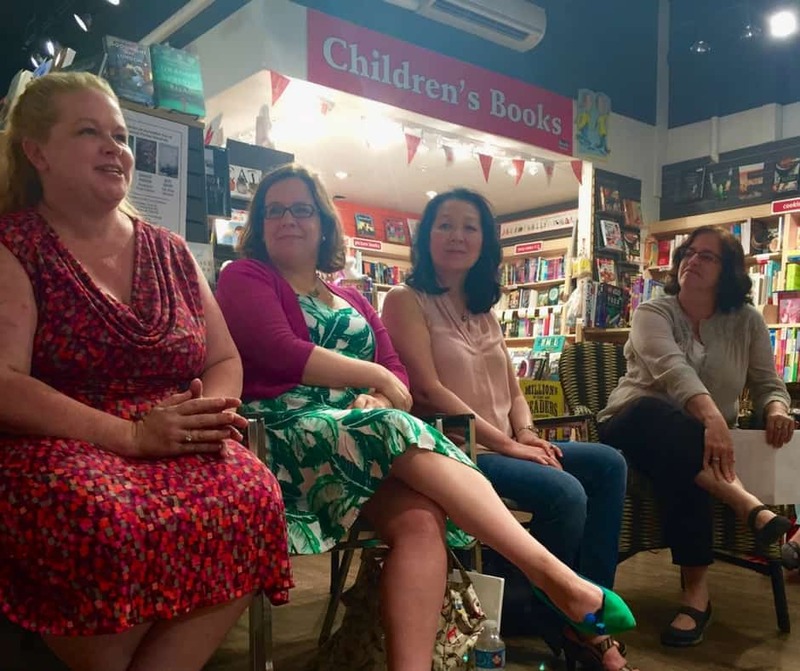 Once traffic began moving again, it was too late to go to the hotel, so I brought everyone back to my house where we got tidied up, poured some chilled rosé, and went along to Main Street Book Warehouse for the event. It was lovely. 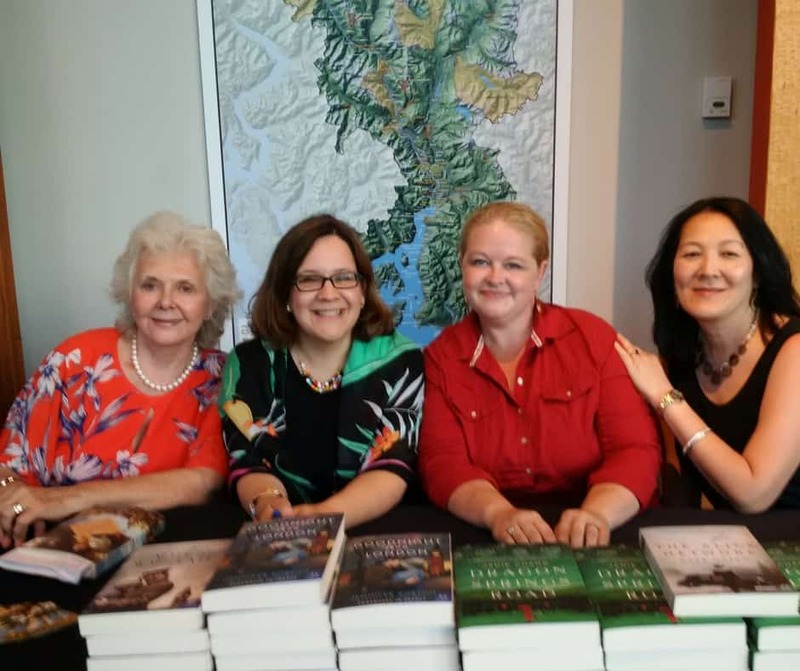 We had another great moderator – journalist, writer, and former book reviewer for the Vancouver Sun Tracy Sherlock (sitting at the end, below). The store was standing room only, we signed lots of books, and Kate met some of her Canadian superfans. 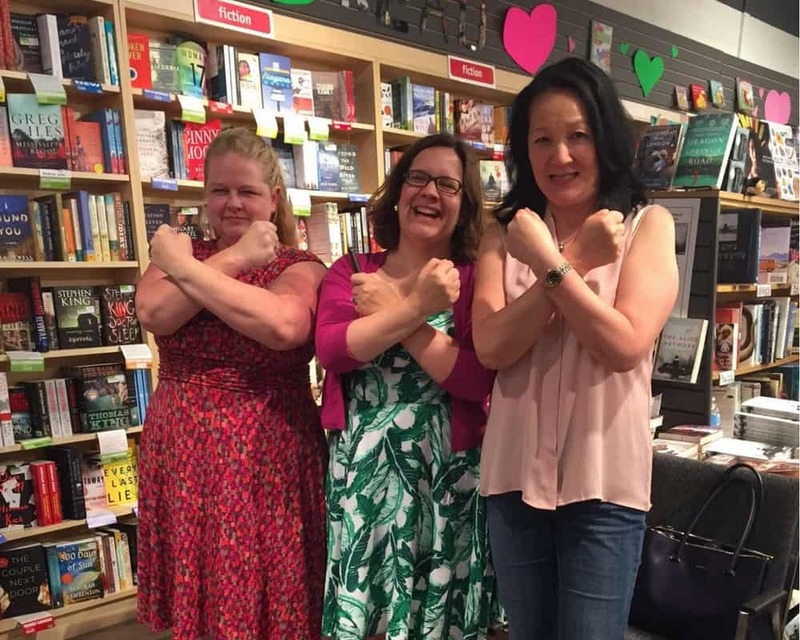 We were also feeling a bit feisty after the events of the day so we did a team shot doing the Wonder Woman pose (that first photo at the top of the blog). My all time favourite photo for this trip. The next morning, Kate and Jen cabbed it from their hotel to sign books at Indigo and I brought the car to Peter’s garage. At 8:00 am. He promised to call once he knew what was wrong. I picked up the ladies from their trendy downtown hotel and explained that we would be driving up to Whistler without AC. Again. Fortunately the drive up the Sea to Sky Highway was glorious, the day hot but not too bad, the views of Howe Sound to die for. We checked into our hotel with time to spare before meeting up for an early supper with author Roberta Rich (her latest novel A Trial in Venice) who was joining our panel for this event, author and Whistler Writers Fest organizer Stella Harvey, who is responsible for this event, and moderator Sheryl MacKay (of CBC Radio’s North by Northwest program). We are batting 3 for 3 when it came to great moderators. We had a nice-sized audience at the beautiful Squamish and Lil’wat Cultural Centre. Again, the event went well, and we signed a lot of books. Here we are with Roberta Rich, who is also my one of my Vancouver author friends. Afterwards, it’s still daylight so we took the long way back and strolled through the village. We made a detour through the parking lot when a small black bear decided to make use of the path we were on. Not that a small black bear is a threat but he was small enough that a protective Mama Bear might’ve been close by. “Would you like to have your picture taken in front of the Olympic rings?” I asked Jen and Kate. 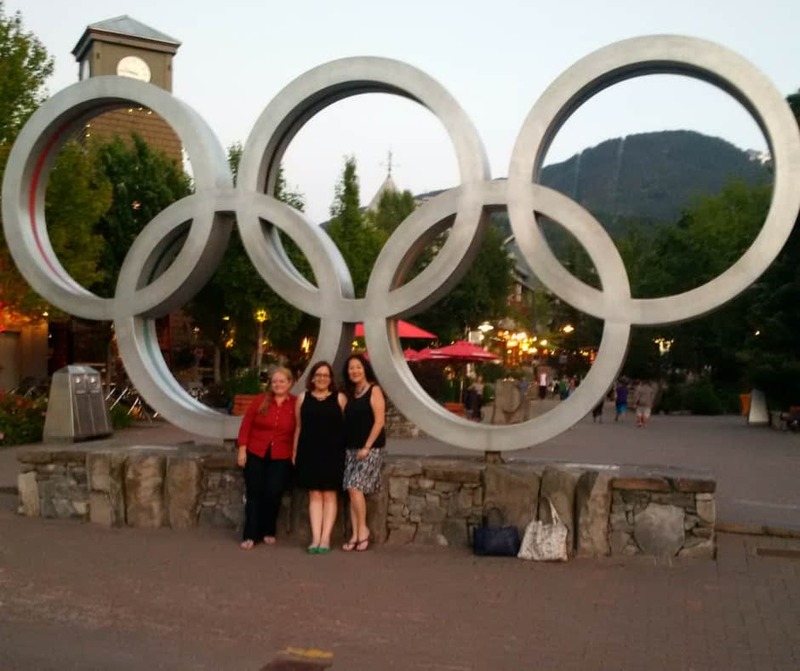 Since Whistler was one of the 2010 Winter Olympics venues. After our photo shoot, a young couple asked me to take their picture in front of the rings. She was petite and gorgeous, he was tall, dark and handsome. As I snapped away, the young man pulled a little box out of his jacket and she just looked confused. I knew what was going on and privacy be damned, I ran closer to record the event. The guy just kept holding out the box and she kept staring at it, and then he dropped to one knee and said something -- and it dawned on her. “Yes!” she said. Then they kissed, and everyone in the vicinity applauded. Kate, Jen, and I practically shoved each other to get a good look at the ring. Young love. It was so cute. The next morning, I checked out of the Marriott Delta Whistler and got the car out of the hotel’s underground parking. The car made a strange, rhythmic noise (ka-thunk, ka-thunk) as it pulled up to the hotel lobby. Jinx of the day. It was a flat tire. “Stuart!” I screamed, running into the lobby (I know this hotel well and Stuart is my favourite valet). “It's a crisis. I have a flat tire and have to get my friends to the airport.” Since the car actually belongs to The Husband, it means that unlike the emergency equipment in my underachieving VW Golf, his spare tire is pumped up and there is a full tool kit including a jack in the trunk. Which allowed Stuart to change the tire in 15 minutes flat. I gave Stuart every bit of cash that was lurking in my purse. Here is a photo of our hero, Stuart. We had a lovely drive back to Vancouver International Airport, staying in the slow lane because you shouldn’t drive past 80 km per hour on a spare tire. We even stopped at a couple of viewpoints to take photos and still arrived safely and on time at YVR where there were many good-bye hugs. 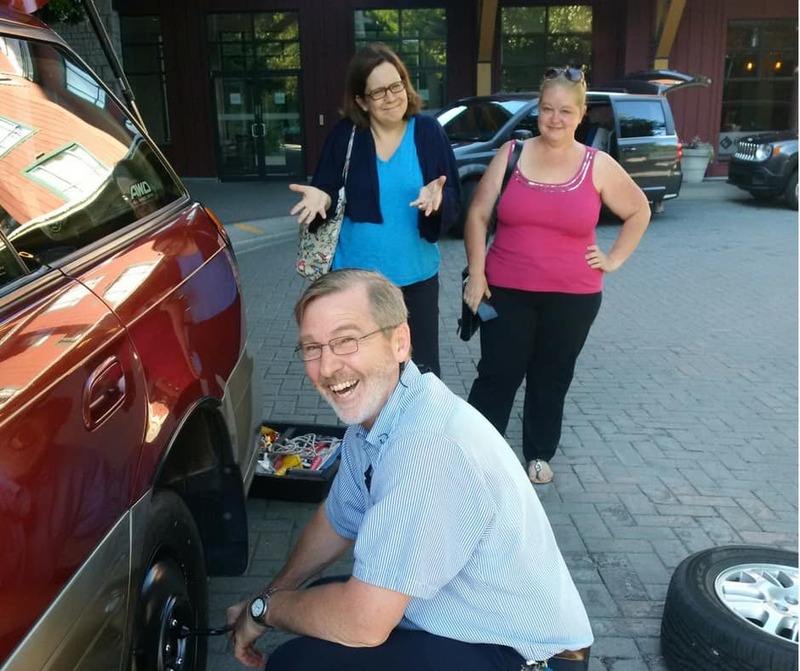 After dropping off Kate and Jen at YVR, I took the car to Peter’s garage and informed him that he also had to fix a flat tire. "But it’s all over and done with now," I thought to myself. "Everyone survived. The Hysterical Fiction Tour is over." That night, email from Kate: her flight from Newark to Baltimore had been delayed 4 times. Instead of 9:00 pm, she will be landing in Baltimore at 2:00 am. You can sense that small mushroom cloud getting ready to explode over Newark. In the morning, more email from Kate: the airline lost her luggage but she’s not taking it personally because they lost everyone’s luggage. But it’s OK. We’re all still friends and can’t wait to see each other again. We laughed a lot despite each Jinx of the Day. I like to think adversity brought us closer. Kate’s book The Alice Network was chosen by Reese Witherspoon for her book club read of the month and there are all those good things that go along with this sort of visibility. Jen’s book Goodnight from London was chosen by the Wall Street Journal as one of their July Books of the Month. How classy is THAT? Dragon Springs Road made the Globe and Mail Canadian Fiction bestsellers list at the #4 spot and wow, it’s nice to be on list along with Kate and Jen. For that, all the jinxes during the Hysterical Fiction Tour were totally worth it.